The first day of spring has come and gone and I am brimming with anticipation for the artichokes, fava beans and pea shoots that will soon appear at farmers’ markets all over Los Angeles. In an effort to cook seasonally, I have stockpiled recipes for fava bean purees and shaved artichoke salads, and held off on making a rhubarb tart until I see the harbinger of spring show up at my favorite Saturday market. Beets are a year-round food here in Southern California, but the vibrant pink color imparted by roasted red beets announces spring almost as much as the honey baked ham I order every year for Easter. So, in anticipation of all the wonderful spring food headed to market, a number of beet dishes have been prepared in my kitchen. This weekend I added a puree of roasted beets to risotto, turning the otherwise neutral colored dish into something bursting with color. The bright pink dish may look almost artificial to some, but served next to a green salad and a rack of lamb, it looks just like spring to me. Trim the beets of greens and scrub to remove any dirt. Wrap the beets in foil and bake until tender, 45 minutes to an hour. When the beets are cool enough to handle, remove the skin by peeling or gently rubbing with a paper towel. 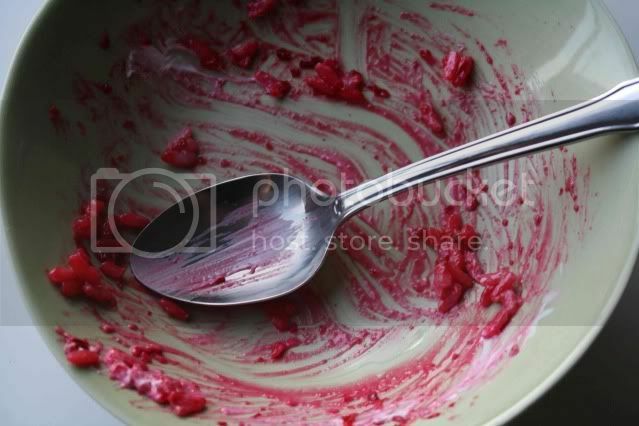 Puree the beets in a food processor and set aside while you prepare the risotto. Bring the chicken stock or chicken stock and water to a boil and then keep warm over low heat. Heat the olive oil and butter in a large saucepan over medium heat. Add the onion and sauté until softened, about five minutes. Add the rice and stir until lightly toasted and turning opaque. Add about a cup of the heated liquid to the rice and stir until fully incorporated. Continue adding liquid, one cup at a time, until the rice is still lightly al dente – you may not need all the liquid. Stir in the beet puree and season with salt and pepper. If desired, add a spoonful of sour cream or crème fraiche to each serving. that is mouthwatering princess food! my daughter eats anything remotely pink, i bet this will be a cheerfull lunch - for her, the color, for me - her cleaned plate. thanks! Your photos are amazing. I'm not a huge beet fan but think I could do that and enjoy them. Thanks. I adore beetroot and judging by your empty bowl, so do you. The colour of the risotto is so gorgeous; and sooo voluptuous. Yum. I've really tried to like beets (my friend is a fiend) but haven't yet succeeded. Perhaps this means another shot. Great looking, that's for sure. cannot wait to try this. have an unhealthy risotto obsession and can imagine the bright earthiness of beets pairing beautifully with creamy risotto. Very pretty! 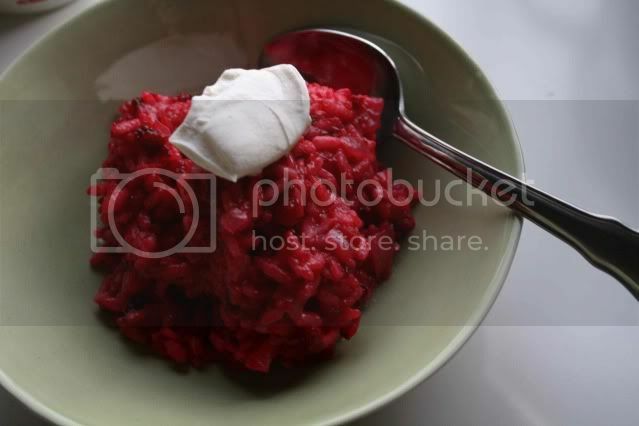 I once made a beet risotto and you can't beat (beet?) that amazing color. Beautiful photos! Beets have such outstanding flavor and color. I love the earthiness. And fava beans. I am looking forward to making pasta with fava beans in the near future. 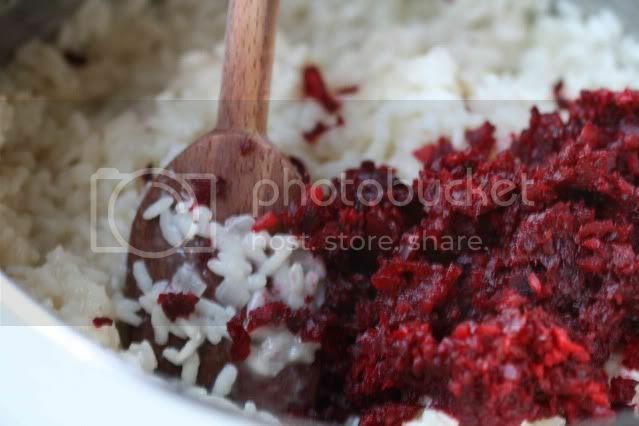 I made a rice dish with beets not too long ago, that was also that same brilliant pink. My girls did love it (and even ate the greens! ), so the pink trick does work. I love beets, and hadn't considered risotto. Thanks for the great idea. What a beautiful colour. I love risotto and love this truly pink version (although I have never tried beetroot!). Great use of beets. One of my favorite ways to enjoy beets is to roast them. You have some great recipes and photos. Beets and risotto.. such a great idea! I might use some of the pink and white beets I get at the farmers market, a lighter hue perhaps? thanks for the idea! My boyfriend laughs that I try to use beets in everything, this will make him chuckle!